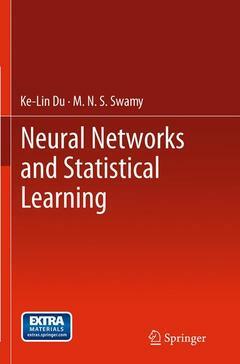 Neural Networks and Statistical Learning Du Ke-Lin, Swamy M. N. S.
Auteurs : Du Ke-Lin, Swamy M. N. S.
Introduction.- Fundamentals of Machine Learning.- Perceptrons.- Multilayer perceptrons: architecture and error backpropagation.- Multilayer perceptrons: other learing techniques.- Hopfield networks, simulated annealing and chaotic neural networks.- Associative memory networks.- Clustering I: Basic clustering models and algorithms.- Clustering II: topics in clustering.- Radial basis function networks.- Recurrent neural networks.- Principal component analysis.- Nonnegative matrix factorization and compressed sensing.- Independent component analysis.- Discriminant analysis.- Support vector machines.- Other kernel methods.- Reinforcement learning.- Probabilistic and Bayesian networks.- Combining multiple learners: data fusion and emsemble learning.- Introduction of fuzzy sets and logic.- Neurofuzzy systems.- Neural circuits.- Pattern recognition for biometrics and bioinformatics.- Data mining.- Appenidx A. Mathematical Preliminaries.- Appendix B. Benchmarks and resources. Ke-Lin Du is currently the Chief Scientist at Enjoyor Inc., China. He is also an Affiliate Associate Professor in Department of Electrical and Computer Engineering at Concordia University, Canada. Prior to joining Enjoyor Inc. in 2012, he held positions with Huawei Technologies, the China Academy of Telecommunication Technology, the Chinese University of Hong Kong, the Hong Kong University of Science and Technology, and Concordia University. He has published two books and over 50 papers, and filed over 15 patents. His current research interests include signal processing, neural networks, intelligent systems, and wireless communications. He is a Senior Member of the IEEE.M.N.S. Swamy is currently a Research Professor and holder of the Concordia Tier I Research Chair Signal Processing in the Department of Electrical and Computer Engineering, Concordia University, where he was Dean of the Faculty of Engineering and Computer Science from 1977 to 1993 and the founding Chair of the EE department. He has published extensively in the areas of circuits, systems and signal processing, and co-authored five books. Professor Swamy is a Fellow of the IEEE, IET (UK) and EIC (Canada), and has received many IEEE-CAS awards, including the Guillemin-Cauer award in 1986, as well as the Education Award and the Golden Jubilee Medal, both in 2000.